Walker County Messenger, 1880-1924, a new public library collection in the GHN. 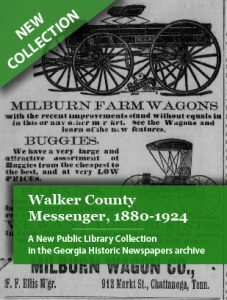 ATLANTA, Ga — Georgia HomePLACE and the Digital Library of Georgia (DLG) are pleased to announce the addition of over 16,000 pages of the Walker County Messenger dating from 1880-1924 to the Georgia Historic Newspapers (GHN) website. 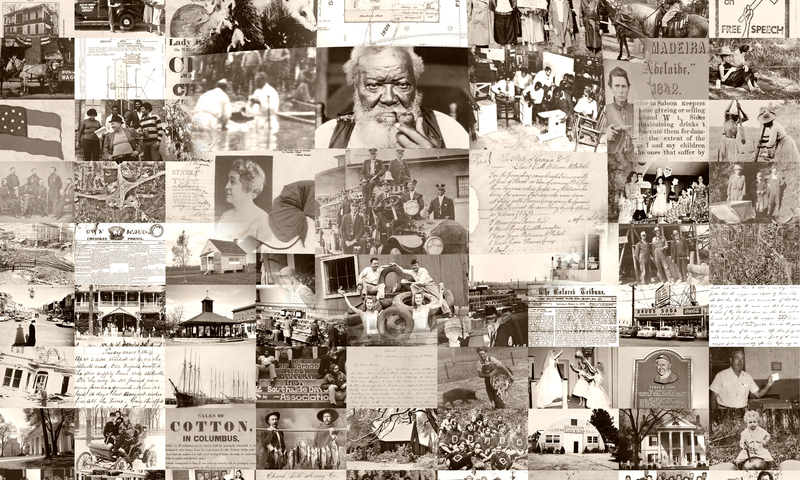 Consisting of over 2,100 searchable issues, the Walker County Messenger archive provides historical images that are both full-text searchable and can be browsed by date. Issues are freely available online through the GHN: https://gahistoricnewspapers.galileo.usg.edu. LaFayette’s first newspaper, the Walker County Messenger, was established by Captain Augustus McHan and his son E. A. McHan on July 27, 1877. In its first year, the Messenger was a six-column, four-page paper that sold for a yearly subscription of one dollar. The paper would serve as the legal organ for not only Walker County but also Chattooga, Catoosa and Dade counties until those regions founded their own newspapers in later years. Today, the Walker County Messenger continues to serve the citizens of LaFayette under the ownership of the Times-Journal Inc.
“Newspapers and libraries keep the pulse of a community, and both are critical to quality research. Access to information resources is one of the core values of Georgia’s public libraries, and we are so pleased to help support our partners at the Digital Library of Georgia in making these newspapers freely available online,” said State Librarian Julie Walker. Historic newspaper pages are consistently the most visited of any DLG sites. The GHN is compatible with all current browsers, and the newspaper page images can be viewed without the use of plug-ins or additional software downloads. Annually, DLG digitizes over 100,000 historic newspaper pages with funding from GALILEO, Georgia Public Library Service, and its partners and microfilms more than 200 current newspapers. “The significance of our local newspaper being available for full-text searching and browsing by anyone with access to the internet cannot be overstated. We feel very fortunate that our local organ was selected by DLG and Georgia HomePLACE for digitization,” said Cherokee Regional Library System Director Lecia Eubanks. The GHN includes some of the state’s earliest newspapers providing perspectives often missing in history books, including important African-American, Roman Catholic and Cherokee newspapers, as well as local and regional papers from across the state. All previously digitized newspapers are scheduled to be incorporated into the new GHN platform. Until that time, users may continue to access the existing online regional and city sites. Georgia HomePLACE http://georgialibraries.org/homeplace/ is a project of the Georgia Public Library Service (GPLS) that encourages public libraries and related institutions across the state to participate in the Digital Library of Georgia. HomePLACE offers a highly collaborative model for digitizing primary source collections related to local history and genealogy. HomePLACE is supported with federal Library Services and Technology Act (LSTA) funds administered by the Institute of Museum and Library Services through GPLS, a unit of the Board of Regents of the University System of Georgia. 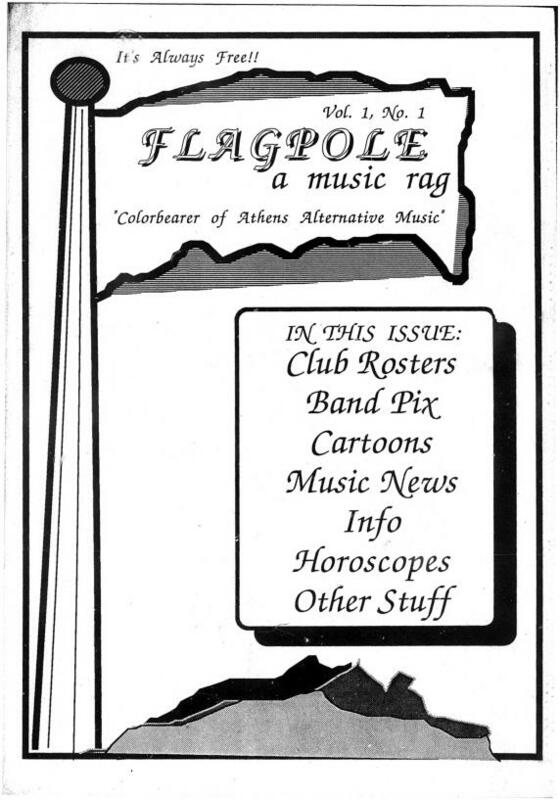 Flagpole Magazine, Athens’ popular alternative newsweekly is the latest addition to the Georgia Historic Newspapers Archive (GHN), at https://gahistoricnewspapers.galileo.usg.edu/lccn/sn94029049/, part of the Digital Library of Georgia, based at the University of Georgia Libraries. The release of this new collection coincides with the 30th anniversary of Flagpole. Athens is unique as a small college town that became nationally prominent in the 1980s thanks to the emergence of breakthrough local music acts that were initially popularized during college radio’s heyday, and later gained traction on mainstream pop radio and MTV. Flagpole quickly expanded its content to include politics, art, theater, movies, books, food, local comics, and advice columns. Music coverage continued in the 1990s with Widespread Panic, Vic Chesnutt, Jack Logan, Jack O’ Nuts, Five-Eight, Hayride, and the Elephant 6 collective bands such as the Olivia Tremor Control, Elf Power, Of Montreal, Neutral Milk Hotel, and Circulatory System; bands on the Kindercore Records label such as Japancakes, Masters of the Hemisphere and the Sunshine Fix were also making their names. Throughout the 2000s, bands such as Dead Confederate, the Whigs, and alt-country bands such as the Drive-By Truckers have continued to thrive, as have annual music festivals such as AthFest and Popfest, which provide Athens venues for local, national, and international independent music acts. The Athens-Clarke County Library is located at 2025 Baxter Street, Athens. It is the headquarters of the Athens Regional Library System, which serves Athens-Clarke, Franklin, Madison, Oconee and Oglethorpe counties with 11 library branches. The mission of the Athens-Clarke County Libraries is to provide information and resources which address the needs of the community, foster enjoyment and a love of reading, and provide a repository of the history and culture of Athens-Clarke County. The Athens Regional Library System vision statement is, “Engaging Communities … Exceeding Expectations.” To learn more about the library system, its services and programs, visit http://www.athenslibrary.org.